It's been a great summer here at Trader Todd's, but we're looking forward to fall. In July we welcomed a new chef, Andy Ramsey, who is introducing some new items to our menu this September. Can you say wontons? Chef Ramsey is also starting a Burger of the Month (BOTM) program. September's Burger of the Month, the Hasselhoff, is inspired by Octoberfest. 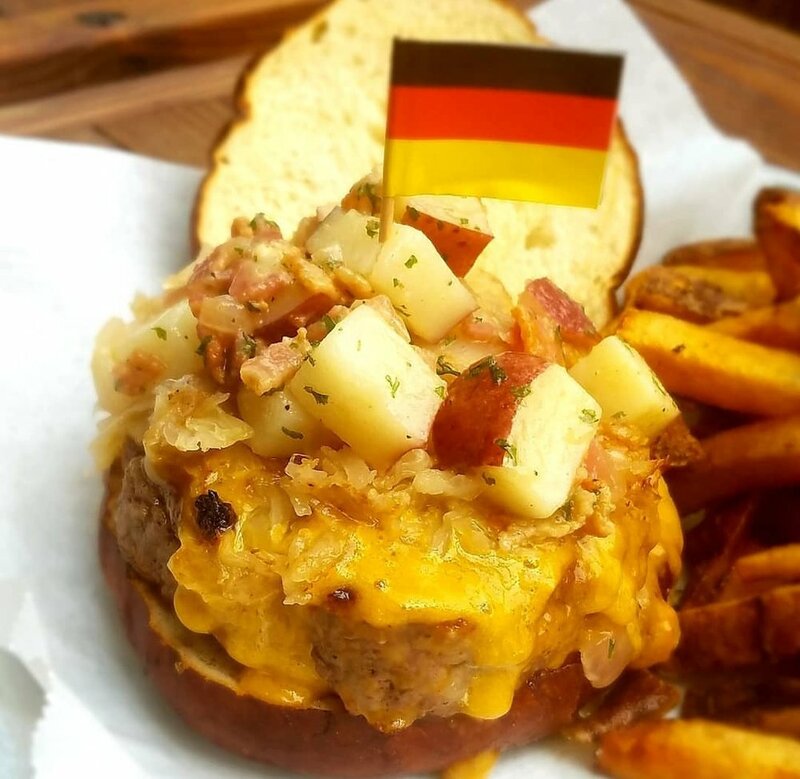 The patty is a half pound ground beef and bratwurst blend, topped with German potato salad, beer cheese spread and sauerkraut, on a pretzel bun with seasoned fries for $13. This burger pairs perfectly with Sam Adams Octoberfest on draft all month for $6 a pint. Join us on Saturday, September 15th from 4 pm to 6 pm for Sam Adams Pint Night. Sam Adams will be sampling out their Octoberfest beer and any customer who purchases a pint can keep their glass stein (while supplies last). Take a photo of you with our BOTM - the Hasslehoff - follow @tradertodds_chicago on instagram, and tag #TraderToddsBOTM and enter to win next month's BOTM on us! Last year’s karaoke stage at the Belmont-Sheffield Music Fest was so popular we’re bringing karaoke back to the streets again this year! Saturday, May 26 and Sunday, May 27, Trader Todd’s will host karaoke at the Belmont entertainment stage at the corner of Belmont and Sheffield. Some of Chicago’s best singers will compete in a reality show-like competition to find out who’s the festival’s best singer! Each day of the festival will have its own grand prize winner, which includes a free, three day, two night trip to Fort Myers Beach, Florida! Think you have what it takes? Every night in May leading up to the festival, from 8 p.m. to close, Trader Todd’s KJs will be selecting the best performers to take the stage during the festival. You can also request a try out on any night by simply notifying the KJ when you request a song, or by sending an email to karaokekahuna@tradertodd.com. Winners will receive a golden ticket, which will serve as a pass to perform one day in front of the entire Belmont-Sheffield Music Fest! Karaoke will be held from 2 – 4 p.m. and 6 – 7 p.m. each day, followed by the finals from 6:30 - 7 p.m.
On Thursday, May 31, Trader Todd’s will host an awards banquet for anyone who received a golden ticket. The night will feature an awards ceremony, karaoke and an hour of an open bar and food! If you're a nerd you're gonna want to come to the festival on Saturday! Don "Ogre" Gibb (from Revenge of the Nerds fame) will be at Trader Todd's on Saturday, May 26 from noon to 7 p.m. for a meet and greet! At the festival, visit the Trader Todd’s, Room 13 and Lakeview Chamber of Commerce beer booths to help donate to our favorite animal rescue groups! The Friends of Chicago Animal Care and Control, and Felines and Canines Inc, Lakeview Employment Group and more! Bruce A. serenading last year's crowd with some Frank Sinatra! This week is National Karaoke Week and we are celebrating at Trader Todd's with Random Acts of Karaoke! What does that mean? Think Carpool Karaoke meets Random Acts of Kindness. We're going to be spreading karaoke joy with four theme nights and the return of our mobile Karaoke Kart. Join in on the fun by dressing up in costume and singing from each night's motif and you might just be rewarded with one of our random prizes (ranging from T-shirts to parties) . Also be on the look out for Trader Todd himself touring around Lakeview in our Karaoke Kart - before and after the Cubs games - you might even see him with his buddy Don "Ogre" Gibb. Party with a Purpose with Trader Todd's! This year for staff trip Trader Todd’s wanted to give back – to their staff and to the Florida environment that inspires the tropical feeling guests experience at Trader Todd’s bar. Todd, Virginia, and nine staff members went down to Bowditch Point Park with marine biologist and conservationist Paul Davis to learn about what we can do to make a difference in our environment. After learning about the pervasiveness of marine debris and how it gets into our ecosystems (I’m looking at you, beach goers), the Todd’s staff put on their work gloves and started the beach clean-up efforts. The ground total of debris removed was around 28lbs, with bartender Brittany pulling in the most at over 6 pounds! A great mantra the staff learned from Paul was “Pick up 4 from sea to shore,” meaning that if every person picked up 4 pieces of trash every time they left the beach, our beaches would be in better shape in no time! 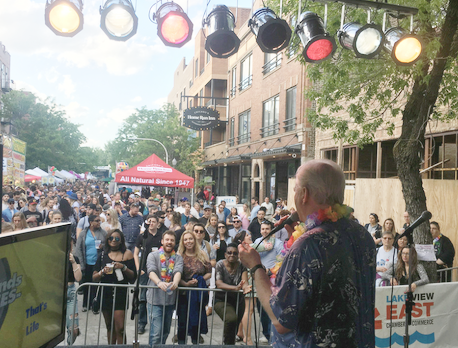 Trader Todd’s is committed to bringing this environmental awareness back to Chicago, and are excited about implementing some new initiatives come spring. As a treat for the staff, and staying true to the beauty of Florida Wildlife, Todd and Virginia brought everyone down to the Plantation on Crystal River to snorkel with manatees! The guides Brian and Steve brought the group right up to the manatees as they swam in the warm, shallow waters, and many staff members got to touch and play with a friendly calf. Keep in mind adult manatees can get up to 10 feet long and weigh over 1000 pounds, so a calf is still a giant at around 4 feet long! It was truly an unforgettable experience for the Trader Todd’s staff, and everyone can look forward to more “party with a purpose” events back at Trader Todd’s bar in Chicago! Trader Todd’s is known as an authentic, pan-tropical themed party spot in Chicago’s Lakeview neighborhood. Chicago’s connection to paradise began in 2001 when Todd Hyatt, Trader Todd himself, wanted to bring his vision of Florida fun to Chicago. Trader Todd’s is your spot for pre-game and midnight celebrating this New Year’s Eve! The celebrity-hosted evening will kick off with a three-hour meet and greet happy hour with Don 'Ogre' Gibb from 5 to 8 p.m. The star-studded party will continue deep into the new year with two complimentary champagne toasts and endless karaoke. We Raised Over $1,000 for Hurricane Relief! Everyone at Trader Todd’s is breathing a sigh of relief today as we’ve reached the end of another hurricane season. We have mostly recovered from the hurricane damage at our marina, but the rest of Florida is still hurting.